Since we love international soccer so much we have decided to begin a series on our favorite World Cup memories. Which like everything on this site will be updated infrequently, without notice and whenever we desire. Sometimes in sports, a minnow kills sharks. Such was the case with Bulgaria and their dream run through USA1994. Led by Hristo “The Dagger” Stoichkov and Emil Kostadinov, this unheralded band of –ovs reminded us why the game is played and delivered perhaps the most stunning upset in history. As shocking as their World Cup triumphs were, their qualification was equally as implausible. 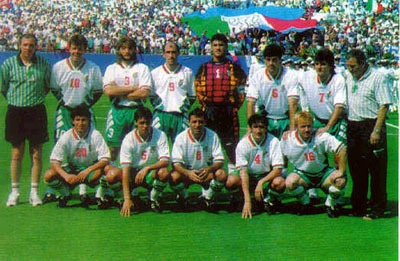 To get to USA 1994, Bulgaria needed to secure a top two finish in a qualifying group which included heavily favored France and Sweden along with Austria, Finland, and Israel. With two games left, Bulgaria found itself 5 points behind France and 3 behind Sweden without control of their destiny. After Sweden took care of Finland securing a spot, Bulgaria’s chances were looking worse as France would be hosting last place Israel needing one point. And this was a bad Israeli team. The French were confident Les Blues would qualify without even needing a result in their last match against Bulgaria in Paris. While Bulgaria took care of business versus Austria to keep hope alive, France took a 2-1 lead against Israel into the 83rd minute. Fireworks and champagne were being prepared on the Champs Elysee and rightfully so. Going into the match, winless Israel had only scored 6 goals in eight games and carried a goal differential of negative sixteen. No one expected anything worse than a draw at this point. It would have been ludicrous to think Israel could score twice in the final minutes. No way, right? Skip to to the 3:50 mark and find out for yourself. Just like that, fireworks were undone, wine restocked, and the final game against Bulgaria took on a lot of meaning. France would qualify with a win or draw. Bulgaria with a win. Despite the collapse against Israel, rational minds could not expect France to lose two in a row at home. Eric Cantona’s temper would not allow it. As the final game began, France had the run of play early. Someone released a rooster (France’s symbol is Le Coque) and everyone had a nice laugh. Shortly thereafter, Cantona rifled home a smooth volley worthy of winning such a match. But those pesky Bulgarians were resistant and Kostadinov headed home from the near post on a corner only six minutes after Cantona’s opener. Tensely, the game wore on with Bulgaria chasing a winner which seemingly would not come. With ninety minutes gone, France was awarded a free kick near the Bulgarian corner. An ideal situation, all which needed to be done was sit on the ball or pass back to expire the last minute or so of extra time. Yet instead of safely passing back, substitute David Ginola decided it would be the perfect time to attempt a cross to Cantona. Why? I do not know. Perhaps, he is an idiot. Perhaps he thought Cantona would smash home another volley to cap off the qualifying campaign in style. Whatever his reasons were for the fateful cross, the result was disaster. Wow! Even if you don’t speak French, you can tell what the commentators thought of the situation. While the focus was on Ginola in the media, they should have credited France’s elimination to the superb lob to Kostadinov and his spectacular finish. Do not tell that to French coach Gerard Houllier though. Houllier resigned and immediately laid all blame for France’s failures at the feet of Ginola, beginning a thus far lifelong public feud between the two. 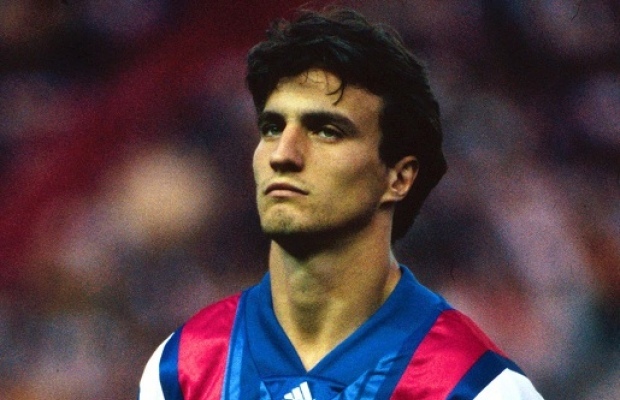 Twenty years later, Ginola filed a slander and defamation suit against Houllier for the continued criticisms by his former coach. Ah France, I hope they never change. No one does petulant collapse quite like them. As a by product of this collapse, most pundits viewed Bulgaria’s qualification to be the result of France’s failures rather than Bulgaria’s talent. No one was expecting too much out of Coach Penev’s team in USA 1994. Drawn in an open group with Nigeria, Greece, and Argentina, Bulgaria needed to secure a top two finish or be one of the best third place teams to advance to knockout rounds. Hoping for a good start, Bulgaria was trounced 3-0 by Nigeria in the opening match. However, they were able to bounce back with a 4-0 drubbing of a very disappointing Greece team, keeping hope of advancement alive. In their final match they needed three points from Argentina, a team on a tear and captained by legend Diego Maradona. While Argentina already secured a knockout spot with two victories, they were not likely to let off the gas since they wanted to avoid stronger competition in the next round. For any team, much less tiny Bulgaria, this was a giant hill to climb. As luck would have it for Bulgaria, Diego Maradona had scored an amazing goal in Argentina’s first match against Greece which everyone ignored. Instead, his zombie-eyed celebration caused a big stir and questions were asked. For any who did not know, we found out Mr. Maradona was not just a legendary soccer player. He was a legendary cokehead. The fallout led to Argentina’s captain being pulled out the tournament before the match against Bulgaria. With the massive disruptions and distractions within the Argentine team, Bulgaria won 2-0 with another quality performance overlooked by the pundits focusing on the Maradona angle of the game. The result meant Nigeria won the group and both Argentina and Bulgaria qualified for the round of 16, where Bulgaria would face Mexico. While Mexico was favored, it was a winnable match for both teams. A back and forth affair, two early goals gave way to extra-time where neither team could find a winner despite several chances. In the penalty round, fate favored Bulgaria as Mexico choked massively missing their first three penalties. Bulgaria on the other hand hit three of their first four happily finding themselves in the quarterfinals. A monumental achievement for a team making only its second world cup appearance since 1974 and which had never gotten past the group stage. At this point, most people thought the Bulgarians were lucky. Their qualification was miraculous and they were fortunate to play Argentina during a scandal involving their best player. Mexico could not hit a penalty to save their lives. Even the 4-0 victory against Greece was disregarded since Greece turned out to be the worst team of the tournament, finishing 0-3 with a negative ten goal differential. But this luck, or skill, was about to be tested. Beating Mexico meant a date with Germany. 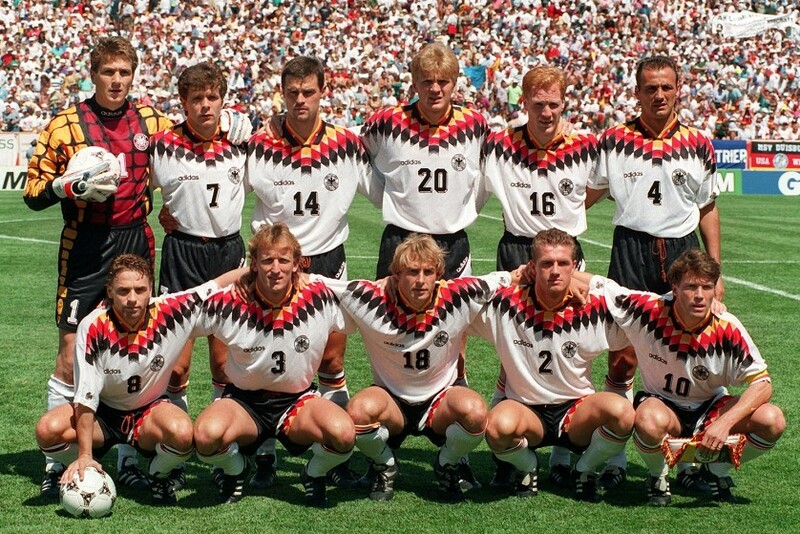 To understand how large a favorite Germany was over Bulgaria in 1994, you have to know a bit of German soccer history. Since 1954, Germany had made the final four of the World Cup every time but twice (1962 and 1978). In those ten world cups, Germany played in six finals and won three. What happened when they did not make the final four in 62 and 78? They were eliminated in the round of 8. This is considered an unspeakable tragedy in German soccer. Football is a simple game. Twenty-two men chase a ball for 90 minutes and at the end, the Germans always win. Or at least so we thought before they played the game. After a slow first half, a shameful Klinsmann dive resulted in a German penalty and lead. But again Bulgaria would not quit. Fifteen minutes from time, they were awarded a free kick 25 yards away from goal. A precious opportunity against the stout German defense. With this chance, Stoichkov delivered a brilliant bender which left the keeper paralyzed and gave Bulgaria a well-deserved equalizer. Tied at one apiece, Bulgaria kept pressing forward while the Germans were still discombobulated after having conceded. All the sudden you knew this was possible. 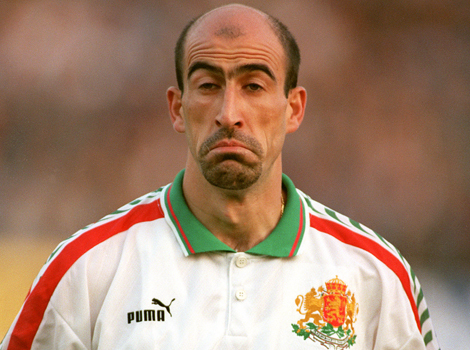 While we had become familiar with the exploits of Stoichkov and Kostadinov, it would be another Bulgarian who would put his name in history and become the most famous balding man of 1994. Germany does not impress him. Just three minutes after Stoichkov’s equalizer, Yordan Letchkov dove in front of the German defender and used his shiny noggin to deliver a historic goal. Bulgaria held on and impossible occurred. Letchkov and his forehead hair-island became an international celebrity overnight. Now I get it. He uses the hair island to target headers. Brilliant! The Germans were stunned and American fans in the crowd who were new to soccer were treated with a upset grander than any they may ever see again. Sadly, Bulgaria could not replicate their magic in the semi-final and lost 2-1 to Italy after an early Roberto Baggio brace. Bulgaria never quit and had their chances throughout the game but could not find a coveted equalizer. And while their 4-0 defeat in the Third Place Match to qualification opponents Sweden may have left a bitter taste in their mouths, their qualification to USA 1994 and stunning victory over Germany remain one the greatest memories in World Cup history.